Oh, so thankful for a good ol’ rainy day…without feeling guilty, I can stay inside and work on any of the multitude of projects just waiting for a start. So…remember…”the sun’ll come out, tomorrow”, my dear friends! On the old cabinet, moved several times back and forth across the country… shown below… are just some of the many other bits and pieces I’ve been collecting for years…every few months I take everything off the shelves, wipe down the wood and then clean every little item with lavender water. While doing this, I reflect on where and when I found an item and the memories associated with each of my treasures…this sometimes takes quite a while to finish…but so enjoyable! Especially while thinking of all the little shops in Southern California, Texas Hill Country, and places I visited and ‘shopped’ throughout Provence…it’s like mini trips! I prefer to use some of my old things for purposes not as always intended: versatility… for example…a collection of very nice old crystal stems are used to hold cosmetics and make-up brushes, small plates fill in for a soap holder, silver sugar shakers for dusting powder, silver bowls for lavender buds, crystal compotes hold chubby candles, espresso cups filled with flowers or herbs and such! The wood candle box is now used to hold my French made LAGUIOLE flatware…this makes it easier to find when sitting down to eat dinner or set my able. Behind the cabinet doors below are tablecloths, bundles of napkins tied with lavender, cloth bags filled with antique silver flatware, my boxes of broken china pieces…and even an old champagne bottle holder found in a Paris flea market! This is used on special occasions for bouquets of flowers, especially roses and phlox, from my garden. Inspiration is everywhere…and, I love the hours spent whenever I can, joyfully scavenging through endless baskets and containers of treasures at flea markets and shops wherever I travel…this definitely lights the fire and challenges my creative nature again and again. Other books I’ve been reading provide vicariously great pleasure…the series by Karen Wheeler are especially enjoyable…TOUT SWEET, TOUT SOUL and TOUTE ALLURE…and I’m impatiently awaiting her next in the series. My French sister, Jeanine just sent me a book that I’m reading now…Lunch in Paris, A Love Story, With Recipes by Elizabeth Bard a charming memoir of eight years living and eating her way through Paris. As I mentioned in past postings, my friends just call it the “chicken wine” ! Holly and I took a short break and walked down the road in the rain…I put an old T-shirt on her to keep the moisture from splashing up on her stomach…it worked. Usually if she is out on a rainy walk she gets soaked underneath and also gets her ‘fur’ rather dirty. This new trick kept her clean and she was quite easy to dry with some vigorous toweling! Funny, she kept walking next to me under the umbrella…hummmmm…smart Border Collie! Sweet pleasures…The smell of freshly cut grass…I did that late yesterday afternoon knowing the rain was coming…ripe berries warmed by the sun offer a juicy bite of the season, yellow pear tomatoes bursting with sweetness and warmth, a hint of gardenia fragrance…and later in the evening, while walking down the road with Holly…the twinkling of fireflies, which really seem to be multiplying every year. I have left several debris piles at the edge of the woods as well as large piles of limbs from a downed trees which provide the fireflies with good shelter and habitat…and of course there is no harmful spraying going on either! Something NOT SO SWEET in my garden…mealy bugs! They are everywhere, sucking away plant life…just look closely and you will see what looks like clusters of tiny cotton balls on stems and the underside of leaves. And they seem to come back year after year, no matter what!! So I still use the same method of removing them…year after year. A hard blast of cold water usually knocks them off and will destroy some of them…I repeat this everyday till they give up. If I were more industrious, I would make an oil and soap mixture to spray on them…but I know there are some mealy bug destroyers [the good guys] at work so will just give them time to help with the problem. Lavender bushes continue to produce fragrant bloom spikes so before the buds form and drop I cut the stems close to the base, collect into bundles and “tie” the bundles with rubber bands…working with and around the bees gathering nectar! Using rubber bands will keep bundles tight as the stems shrink…or loose moisture. 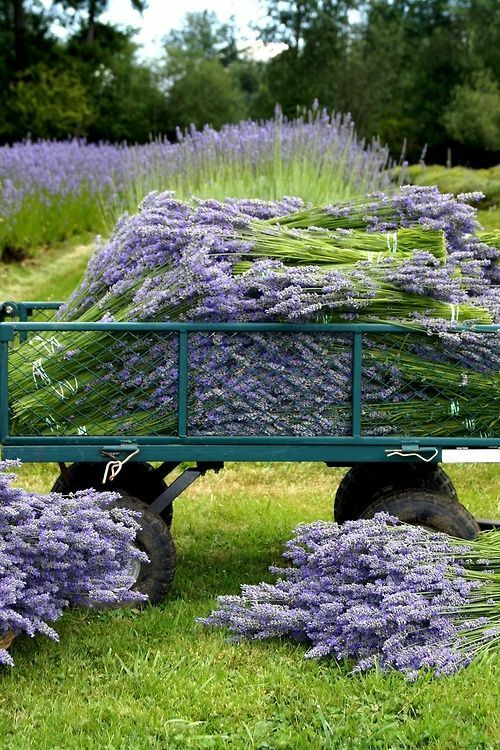 To collect and store the bundles till ready, I use a large sturdy English trug…wish I had the capacity to grow all the lavender shown in the wagon. Since my garden is surrounded by woods, I have to grow lavender bushes in the few spots that get at least 4-6 hours of sun…with good drainage, too! Several bushes are planted along the path steps that wind through the garden…as I brush by the foliage the delicious scent of lavender fills the air for a while…I stop for a moment and remember sitting in the lavender fields of Provence with Jeanine. WAKE UP!! BLUEBIRD Moment…Standing by the sink washing dishes this morning…such joy watching the ‘birdy’ parents fly in and out of the nest box, carrying nourishment to their hatchlings. The blue of the skittish male is astonishing in color and depth….compared to the female who appears to have no mirror in her nest. To attract these beautiful creatures to your garden…PROVIDE PROPER HOUSING! 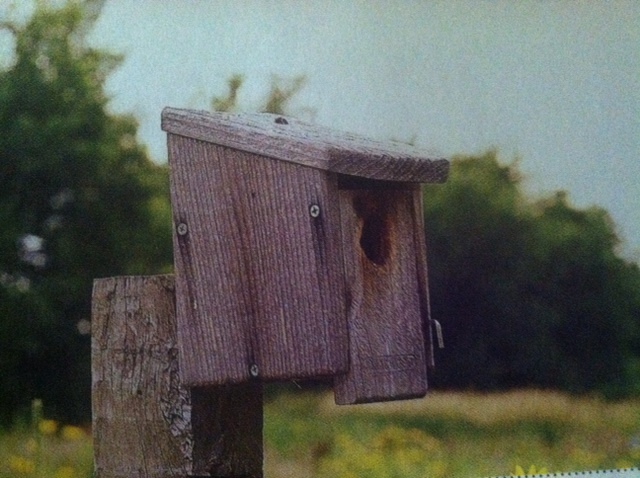 Not all bluebird nesting boxes are created equal…make sure the boxes are made from cedar…NOT pressure-treated wood, provide the proper size entry hole [usually 1 1/2″ ] and no perch is needed…like the example pictured left. 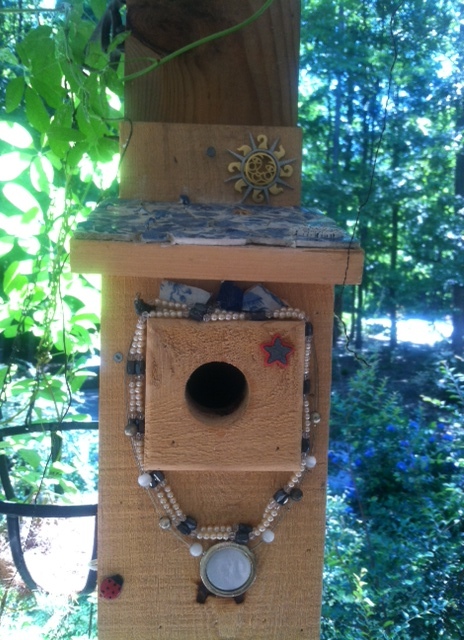 I made some nice decorative/design improvements to a new cedar house a friend made for me. A bit of bling for the lady of the house and a nice tile mosaic roof for the male…who would obviously prefer hunting for food than repairing the roof! For the roof I used some pieces of antique dishes that broke years ago…but I kept them and have used bits of them for several projects. This ’tile’ roof will preserve the roof and keep the box useable for many more years. Even though the natural location for a bluebird nest is a tree cavity…a nest box provides comparable shelter. While living in Texas I made a Bluebird Trail around our property to attract the beauties to a new habitat. Fairly easy to do:I just collected a dozen cedar boxes, attached them to the top of 6′ fence posts and spaced them at 150-200 foot intervals around the five acres. This is so the Bluebirds can establish territories. AND, I made sure to site the entry holes away from prevailing winds, shaded from afternoon sun. I’m doing the same thing here in Virginia but because the property is a bit smaller I have one box in the back garden and one shown above in the front of the house. “ANNABELLE”…such a lovely, romantic…and quite southern name…even though they originated at the University of Illinois in the early part of the 20th century. 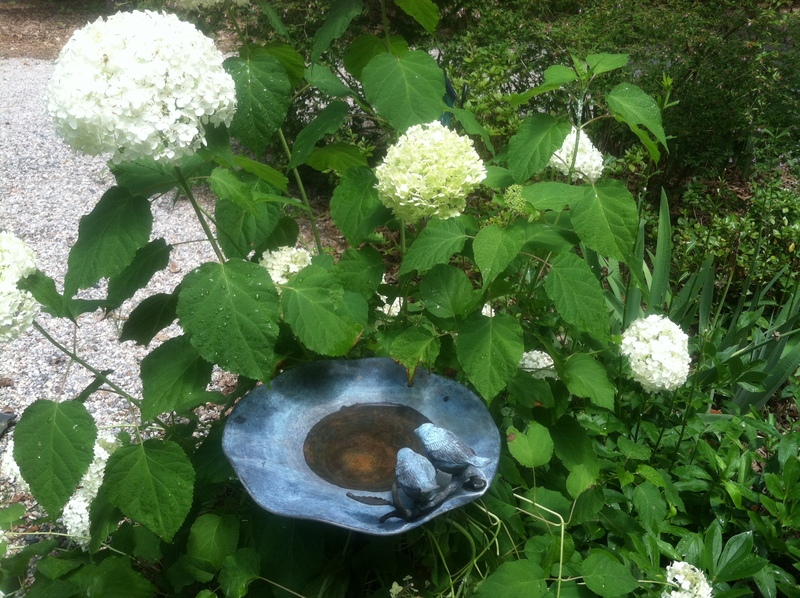 This stunning, old-fashioned hydrangea…Hydrangea aborescens…produces large white blooms consistently throughout the summer…[see the HUGE pompom like blossoms that fill the entry to my front porch with exquisite fragrance, to the left] . 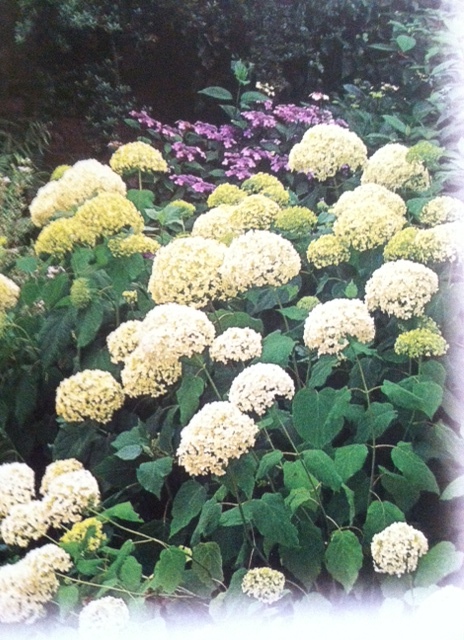 These native shrubs, part of the wild hydrangea family, are easy to grow as they bloom on new wood and require minimal maintenance…just provide a good site with, rich organic soil, morning sun, some afternoon shade and consistent moisture. An especially striking feature is the chartreuse shade of flowers when they first appear…and turn to creamy white with age…hummm! Many landscapers fail to use these in their designs…but I find them to be very useful and will typically include them in my landscapes…such flowing shape and blooms help to create a less formal look in the garden. My affinity for hydrangeas of all form and color has a lot to do with tradition and nostalgia…but I find that they fit easily into many landscape designs…offering a variety of shapes, shades and structure. 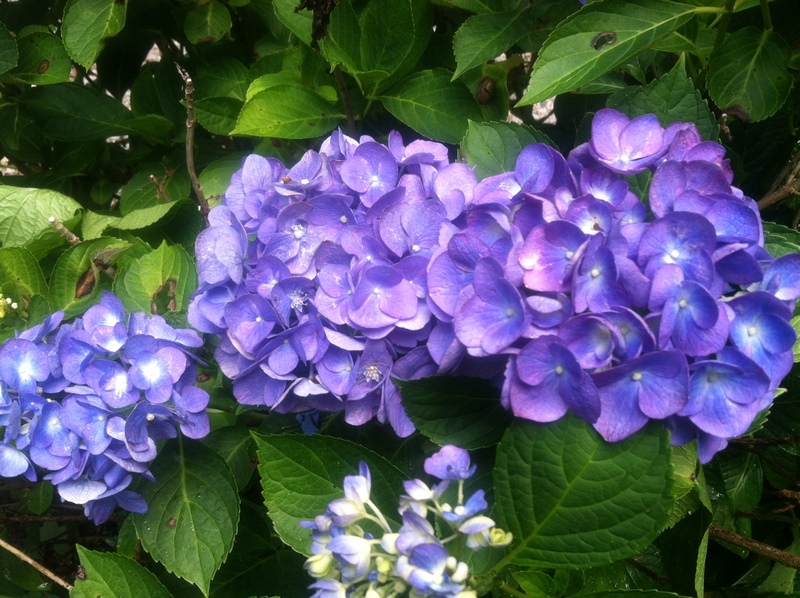 DRYING HYDRANGEAS…EASY!! Once the blooms have opened fully and the flowers have JUST started to fade…resist the temptation to harvest the flowers at the height of their color…Cut bloom stems at least 12-18 inches long; Strip the leaves from the stems and place the cut flowers into a container filled with fresh water, the stems should be submerged at least halfway; place in a well-ventilated area away from direct sunlight; NOW, WAIT patiently until the water has dried/evaporated from the container. When there is no more liquid in the container, the blooms are dry and ready to be used. HEIRLOOM TOMATOES…my favorite tomatoes to grow…and eat…are all heirloom varieties. This is a term used to describe any tomato plant that is openly pollinated...by wind and bees…and has been cultivated for more than 50 years. Farmers typically save seeds from heirloom varieties at the end of the growing season for use in the next season. These prized seeds, often called heritage seeds, are/were passed down from one generation to another . NOT TO BE CONFUSED WITH MAN-MADE, HYBRID CROSSES OF DIFFERENT LINES. Heirloom tomatoes are usually cultivated by small-scale farmers and home gardeners who actually appreciate the flavor and colors of the tomatoes…there are odd shapes such as pear, cherry and grape and many sizes such as Beefsteak and Brandywine. FLAVORFUL RAINBOW…These tomatoes vary in color from classic red to orange, gold, yellow, pink, purplish black and even green when ripe. They have terrific texture because they ripen on the vine and are not stored under refrigeration. The salad pictured left is an mix with fresh herbs and crumbled goat cheese. Now I really want a tomato sandwich!! DIG IT!! 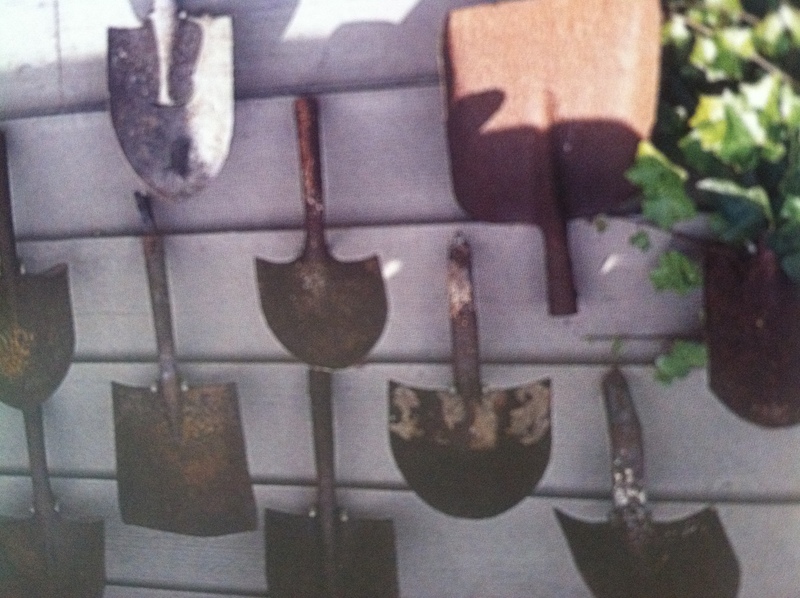 Just wanted you to see the great idea for using old shovel heads…here they make great garden “sculpture” hanging on a wall…I hung a collection of old shovels on my farm gate entry onto our property in Texas…Those shovels hanging on the shop gate made it pretty clear to customers where to enter the farm…and it was a great way to display some unusual old shovel heads. Many friends have asked about my banner photo…it is CERISE, my little friend that I found in a small village shop in Provence, she goes everywhere with me…and Holly, too. She is a replica model of a deaux Chevaux or Citroen 2cv…which was produced in France from 1948-1990. MANY are still in use today, life size, of course! she is a scooter named, Brise…French for breezy…Voila!